As the blockchain world gears up for the third edition of the annual Ethereum developer conference in Cancun, Mexico – CVA member Etherisc is back in action as well – this time upping its game from last year – with a fully-licensed, fully-regulated flight delay insurance product based on Ethereum. What is, perhaps, most important – it now accepts payment in both crypto and fiat currencies. Read the full story here on Insurance Journal. Karl Kreder, Co-founder of Grid+, a Consensys project, joins us to talk about how blockchain technology can help disintermediate utilities and allow consumers buy electricity directly from producers. The Grid+ Agent is a hardware device which sits in your home, is connected to your energy meter and can interact with the power grid. Zug, Switzerland, October 2, 2017 — Crypto Valley Association (CVA), the Swiss-based not-for-profit association supporting the development of blockchain and cryptographic related technologies and businesses, today distributed a paper on behalf of MME and Blockhaus, proposing a new method for token classification. Both MME, the leading Swiss consultancy firm for law, tax and compliance in Blockchain applications and Blockhaus, a developer of decentralized investment banking platform applications for tokenized ecosystems, are active members of the CVA. The framework was developed specifically for utilization for regulatory and critical risk-assessment purposes. The paper, entitled “Conceptual Framework for Legal & Risk Assessment of Blockchain Crypto Property,” introduces the concept of Blockchain Crypto Property or BCP. BCP is defined as digital information that contains all elements of a property right that is registered on a blockchain or in an alternative digital ledger, which can be transferred via protocol, that may carry out additional functions governed by a Smart Control System, following coded or manual input. “Information on a blockchain is unlike any other previous incarnation of digital information. Blockchain Crypto Property shares many of the characteristics attributed to physical and other tangible properties as we understand them in the law, and yet BCPs are expanded with purely digital characteristics as well. These are groundbreaking concepts that require further examination and novel classification. Our paper examines the legal and risk characteristics of this completely new kind of property. A common understanding of the underlying nature of different kinds of cryptographic tokens would allow policymakers to construct thoughtful and enforceable legal and regulatory frameworks. Moreover, an agreed-upon framework could also provide investors and issuers with standard tools to evaluate, mitigate, and communicate risks in token design and launches,” said Dr. Luka Müller, Partner at MME. The MME and Blockhaus paper contains a functional approach in defining the three main categories of BCPs: tokens without a counterparty, tokens that have a counterparty, and a completely new asset-class, tokenized co-ownership. The “without counterparty” classification is represented by native currency tokens, infrastructure tokens, and application tokens that do not grant holders any rights and have no underlying assets; tokens like Ethereum and Bitcoin fall into this class. The second classification, or “counterparty class,” refers to tokens which include any form of a relative right, such as the right to receive an asset or financial payment, either against the token generator or a third-party. The final classification, the “co-ownership class,” denotes tokens with smart contracts that are programmed or registered on the blockchain, allowing individuals to participate and co-own a technical platform or a form of intellectual property. The main purpose of functional categorization is to grant a structured approach for legal, regulatory and tax assessment purposes. In addition, the BCP concept provides tools that will enable interested parties to make clear and well-founded analyses of tokens from legal and risk perspectives, in turn making it easier to identify frauds and uncover potential flaws. Consequently, the ability to categorize assets and assess risks is of huge value not only to regulators but to investors and token issuers. In addition to the three BCP classes, MME has devised risk cases in order for regulators and potential investors to assess the risks associated with tokenized assets. These fall under four categories: functionality and protocol-related risks, such as network attacks and faults; storage and access of private key-related risks, like hacked wallets and exchanges; market-related and counterparty risks, such as insider trading and liquidity risks; and regulation and money laundering-related risks. “The issue of the legal and regulatory status of cryptocurrencies is currently the most pressing concern in our community. Crypto Valley Association has called on regulators to devise clear, comprehensive, and flexible regulation on tokenized assets that protects investors but also supports innovation. We believe that MME’s BCP concept is an important contribution to this debate. It can be of immense use to both regulators seeking to understand cryptocurrencies and investors looking to evaluate their risks,” said Oliver Bussmann, President at Crypto Valley Association. With offices in Zurich and Zug, MME is a leading consultancy firm in law, tax, and compliance. MME advises and represents companies and private clients in commercial, corporate and private business matters. Prominent in the blockchain legal space, MME has assisted many crypto organizations set up in Switzerland. “We are now entering a new age of the tokenized ecosystem. In order to understand the opportunities associated with tokenized assets, while also recognizing the risks, we require a clear conceptual framework to open the doors of the tokenized economy for mainstream adoption. The BCP concept we are proposing should serve as a method of structured discussion between all participants of the blockchain community,” said Dr. Müller. Headquartered in the Swiss canton of Zug, Crypto Valley Association is the independent, government-supported association established to take full advantage of Switzerland’s strengths to build the world’s leading blockchain and cryptographic ecosystem, working with government to foster the development of pioneering digital technologies in Switzerland and internationally. To date, four of the five largest token sales recorded have been completed by companies based here in Switzerland, attracting a combined investment in bitcoin and ether of over $600 million USD. “Conceptual Framework for Legal & Risk Assessment of Blockchain Crypto Property” can be accessed here. The paper was written by, Dr. Luka Müller, Stephan D. Meyer and supported by Christine Gschwend and Peter Henschel. An in-depth interview with Luka Müller on the BCP concept is available on the Crypto Valley Association blog. Oliver Bussman talks about Crypto Valley at SIBOS 2017. The Ambrosus project, a Swiss-based effort to develop blockchain-based ecosystems for life-critical supply chains like those for food and pharmaceuticals, was the subject of a profile on the Swiss TV business magazine Eco last night. The journalists also spoke to CVA member Daniel Diemers, Partner at PricewaterhouseCoopers. The subject of the segment was the recent ICO boom and how it is helping young companies in Switzerland to get financing. The segment can be viewed here (German). While today’s global supply chains are remarkable in many ways, they are also often inefficient, relying on outdated technology or manual processes, and prone to errors and fraud. Blockchain technology, which can be used to securely record and transmit data in decentralized networks, has long been seen as a promising means to improve these chains. Ambrosus, which is a member of the CVA, is a project to build a blockchain-based ecosystem for supply chains for life-essential products like food and medicine (although, as its founders point out, the protocol can be applied to almost any complex supply chain, such as commodities). One thing that sets Ambrosus apart from other projects is that it is building hardware as well: sophisticated sensors that can constantly monitor and securely send data to the blockchain as an item moves from manufacturer to end user. Another interesting aspect of Ambrosus, at least from our point of view at the CVA, is that it is very much a homegrown Swiss effort. Not only is the project based in Zug, but much of its key technology has its roots in the EPFL, which is one of Switzerland’s and the world’s top universities. Many of the key figures in its management team are Swiss as well. This includes Chief Technology Officer Stefan Meyer and the newly named Chief Product Officer Vlad Trifa, along with Head of Science Professor Esther Amstad and Professor Jean-Paul Sandoz. To learn more, we talked to Stefan and Vlad about the background and ambition of their project. Vlad, you built and led the Digital Innovation Lab at Swisscom, Switzerland’s largest telecommunications company. You have been an advisor to the Ambrosus token sale, but have just announced you’re joining Ambrosus full time as its Chief Product Officer. Why the move? I think Ambrosus is one of the most exciting blockchain projects in Switzerland, and one of this country’s most interesting startups in any field. While our country has its fair share of startups working on cutting-edge core technologies, there are fewer here – or anywhere, for that matter – that have both an interesting product and one that addresses a really important business problem. Ambrosus’s ambition is to rethink and improve life-critical supply chains like food and pharmaceuticals. The idea is to combine blockchain with high-tech sensors to do tracking and ensure traceability, integrity and efficiency along the whole chain. That’s ambitious. It’s not an easy win – but considering the inefficient and unfortunately often insecure ways these critical supply chains are managed today, I think it’s a very worthwhile goal. It also matches well with many of my own interests. I studied computer science at both the Ecole Polytechnique in Lausanne, where I got my masters, and the ETH in Zurich, where I got my PhD. My interests are in distributed computing in general and the Internet of Things specifically, and I have been highly involved in the IoT community for a very long time. I was one of the founders of webofthings.org, for example, as well as of EVRYTHNG, which has been a successful IoT smart products platform. I even co-wrote a book about the web of things. One thing I have consistently argued is that the IoT needs to be built on open platforms using existing or open source protocols as much as possible. I really think interoperability is crucial. With the advent of blockchain we have the missing link to connect physical hardware, like sensors, to the Internet in a way that ensures data integrity and, through smart contracts, allows for high levels of automation. Ambrosus is built on these principles, which is why it not only interested me but, considering my previous experience, why I thought I could contribute. So what is your vision for Ambrosus after the token sale? I think Ambrosus is catering to a promising market. It is building a product that almost all stakeholders in the supply chain really want – from the producers to distributors to consumers. The common denominator in this is transparency and trust. As the CPO of Ambrosus my main focus will be to work with the development team and our potential clients to help shape the portfolio so that, using Ambrosus’s ingredients, they can develop ecosystems that address their issues, bring down costs, and increase efficiencies. 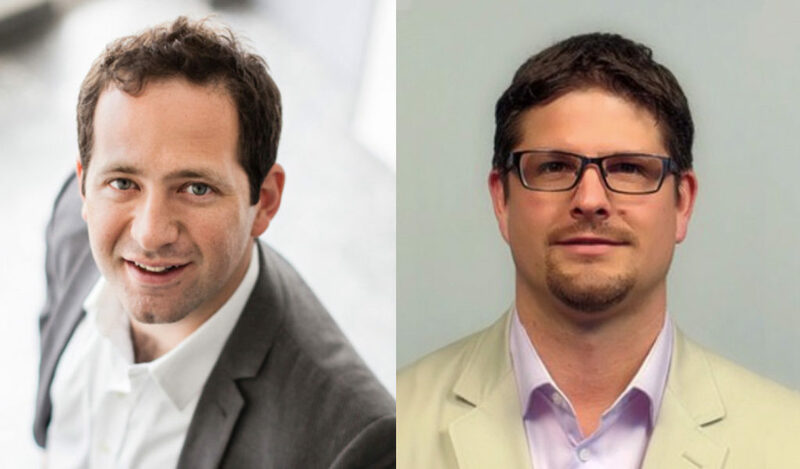 Vlad Trifa, left, and Stefan Meyer, CPO and CTO respectively of Ambrosus. Stefan, you are one of the founders of Ambrosus. What’s your background, and why this project? My academic background is in food analysis, sensors and data encryption. I did my masters at the EPFL in Lausanne, and after getting my PhD at the University of Leeds, I returned to Switzerland and have been among other things associated with the EPFL’s Innovation Park. I helped found Ambrosus for two reasons really. One is because I recognized that there was a clear problem with supply chains today. Until now, it has been difficult to get accurate data about the state and integrity of materials and products in a long chain. And even where data is available, it is challenging to collect it, aggregate it, disseminate it and, above all, ensure its accuracy and integrity. The other was because we saw that technology had advanced to a point where we could solve most if not all of these issues. I am talking in particular about advances in sensor technology and of course the invention of the blockchain. With these building blocks we can develop supply chain ecosystems that are not only more secure than what we have today, but also more efficient and transparent. That’s the motivation. What kind of technology is Ambrosus using? Are you building everything yourself? In my opinion the heart of the supply chain problem is a data problem. How do you get accurate data, then how do you store it, how do you aggregate and analyze it, and above all, how do you make sure no one is tampering with it? The technologies we are developing at Ambrosus deal with all these aspects. We are working on advanced sensors that can be attached to individual items in a supply chain – a food product or medicine for instance – and monitor its quality and its environment all through the journey from the point of origin to the end user. We are also building a blockchain-based protocol that can be adapted for use in different supply chain settings. This can be used either with our sensors or, depending on the situation, with existing sensors or new types of sensors developed by someone else – it doesn’t matter as long as we can be sure the data is good. Because our protocol is Ethereum-based we can also write smart contracts, which should add lots of efficiencies as well as transparency and accountability to the whole chain. We are launching a new token too, Amber, which is used to bring the whole thing together. An Amber token is associated with each item in the chain. Among other things it holds the data as the item moves along, and also provides incentives for all the stakeholders to do the right thing. So it is a central part of the equation. You are currently launching Amber in a token sale. What are your plans for the project once you’ve raised funds? Basically to continue with what we have already started. Besides the work on the technologies I already mentioned, for instance, we have developed a working decentralised marketplace where farmers can make direct sales to buyers at no commission. This is a good example of the new kinds of ecosystems we can build with Ambrosus. We are also developing a decentralised commodities trading platform, where agricultural commodities coupled with quality certificates can be traded securely and quality can be assured through the accompanying Amber token. And we are building apps for consumers to conveniently scan the packaging and receive full information about the history of the product on hand. We already have a working version of one of these too. If I say so myself, I think we’ve accomplished a good deal in the early stages of the project. The purpose of the funding is to finish what we’ve started and then to go on developing new products and services. Ambrosus, which is a member of the Crypto Valley Association, is a project to radically improve the global supply chains by creating a trusted ecosystem in which it is possible to reliably record the entire history of products and execute commercial transactions accordingly. 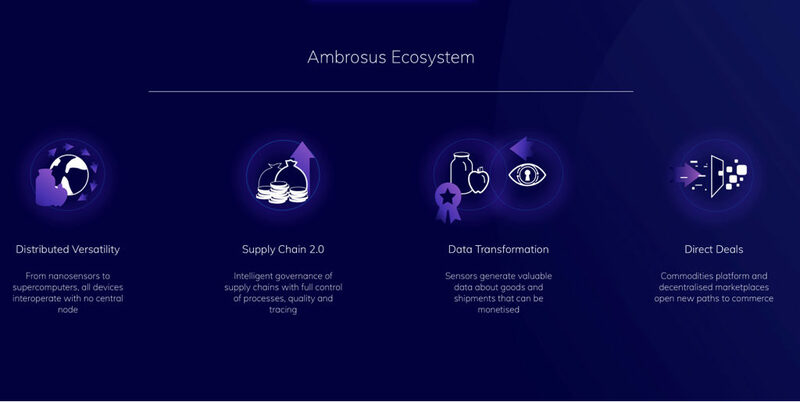 Ambrosus seeks to enable a more secure and autonomous supply chain, improve distribution processes and allow consumers to easily see where their products come from and what is really in them. More on Ambrous at www.ambrosus.com. The Ambrosus token sale runs through October 22. The project was also recently featured on Swiss TV (German). Stefan has over 20 years of R&D experience in food analysis, ultrasound sensors and data encryption. Previously, Stefan led R&D projects at Nestlé, MHM Microtechnique and Vitargent Biotech and also sold two projects to Maersk Group and Perrot GmbH. He was the Founding Managing Director of the Integrative Food and Nutrition Center at the Swiss Federal Institute of Technology (EPFL). Stefan holds a PhD in Food Science (ultrasound applications in food industry) from the University of Leeds and an MSc in Geosciences from the University of Lausanne. Stefan is also a Member of the Swiss Federal Office for Agriculture. Vlad is the Founder of Web of Things and former Head of Digital Lab at Swisscom. As Co-Founder of EVRYTHNG, he has designed and built large-scale IoT platforms used by Fortune 100 companies (incl. Coca Cola, Unilever, LVMH, GE). Previously he served as Research Associate at MIT and UCLA. He holds a PhD and MSc in Computer Science from ETH Zurich and EPFL respectively. He also co-authored the seminal book Building the Web of Things.